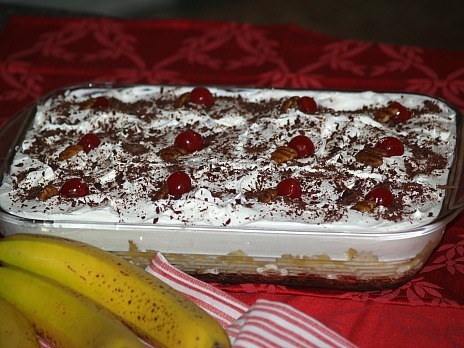 I want to share some of my favorite banana desserts with all of you. I especially hope that my good friends in Ecuador and Costa Rica enjoy them. When I am there I often carry the locally grown bananas with me as I am out moving about; they make great snacks. Here, I usually pick out the biggest bananas that I can get; there I really love the flavor of the little ones. I have always loved bananas and banana desserts. I often share with you many things I experienced when I was young. We never had bananas too often; maybe that is why I love them so much. Very few bananas have ever been grown in the United States so our access to them was very limited. Back when I was young and the bananas got over ripe in the stores, they would reduce the price to pennies. This is when Dad bought bananas and he bought lots of them; big brown shopping bags full. We could eat all we wanted to make up for the times we did not have them. Not only are banana desserts a favorite of mine but bananas rank right up there with chocolate as a favorite around the world. This is why I want to share some of my American recipes with all my friends in all the other countries who love this fruit as much as I do. From Central and South American I have had some delicious banana bread and banana cakes. Also in these countries and the Asian countries, they make wonderful fried banana fritters; these are always delicious. I was so surprised to find how popular ice cream banana splits are around the world. Some of them are so elaborate and sooo delicious! NOTE: If bananas are too green when purchased, place in brown paper bag with an apple or tomato overnight to speed up the ripening process. 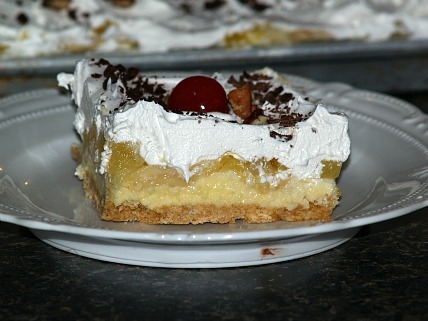 Although there are other types of bananas (less sweet) banana desserts are a favorite of many of the tropical populations. Besides Costa Rica and Ecuador many are grown in Columbia, Guatemala and Honduras where they are the staple starch. The less sweet varieties are used like we use potatoes; in many different recipes. I understand why bananas are one of the most widely consumed foods in the world. This is one of those foods that I would like to experience the recipes from all the other countries. Mainly banana desserts, of course! This is one of the very best banana desserts that you can imagine. Our family rarely has a get together without someone bringing this dessert. It really is a banana split without the ice cream; don’t worry, you won’t miss the ice cream. I make this in a half sheet cake pan (12 X 17 X 1); anything any smaller is too small. Don’t worry about having too much; it goes fast. Combine graham cracker crumbs with melted butter; press on bottom of half sheet tray. Refrigerate tray until preparing remaining ingredients. In mixing bowl beat softened butter and powdered sugar; beat in eggs one at a time. Rinse and drain maraschino cherries on paper towels. Have nuts already chopped; have whipped topping thawed. Remove pan from refrigerator; spread with butter, sugar and egg mixture. Scattered crushed pineapple evenly over top of bananas. Spread thawed whipped topping evenly over pineapple. Scatter grated chocolate and nuts evenly over whipped topping. Refrigerate a few hours before cutting this yummy banana dessert. If you are making a banana dessert recipe just for your family, the one above may seem too large. This is a smaller version but equally delicious. Combine in a bowl graham cracker crumbs and melted butter; mix well and press into 9 X 13 pan. NOTE: I set crumb crust in refrigerator to set a little while preparing remaining ingredients. Combine and mix softened butter, powdered sugar and eggs; beat until fluffy. Spread sugar mixture over crust; slice bananas and layer over the sugar mixture. Spread drained pineapple over the sliced bananas. 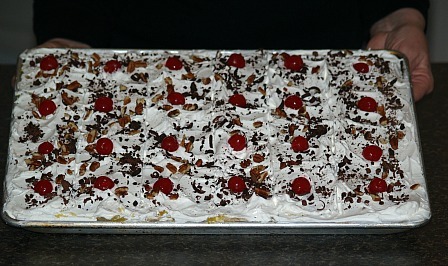 Spread whipped topping over the pineapple; garnish with chocolate, cherries and pecans. Refrigerate to firm up before serving. STORE IN REFRIGERATOR. 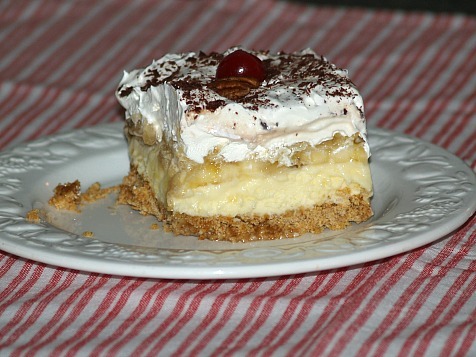 If you are a pie lover this will be one of your favorite banana desserts. It just can’t get much easier and better than this recipe. If you do want it easier, you can purchase an already made 9 inch graham cracker crust to replace the vanilla wafer crust. Reserve 30 vanilla wafers; crush remaining cookies to fine crumbs. Stir together crumbs and melted butter; press on bottom and up sides of 9 inch pie plate. Bake in preheated oven at 350F degrees for 10 to 12 minutes or until lightly brown. Set on wire rack and cool completely before filling. Arrange banana slices on crust; prepare filling. Combine and blend together sugar, flour, eggs, yolks and milk. Spread half of hot filling over bananas; top with 20 vanilla wafers. Pour remaining hot mixture over vanilla wafers; filling should be about ¼ inch higher than edge of crust. Beat 4 egg whites on high speed until foamy; gradually beat in ½ cup sugar until stiff peaks form. Spread meringue immediately over hot filling sealing the edges. Bake for 10 to 12 minutes or until meringue is golden brown; remove from oven and cool. Tuck remaining 10 vanilla wafers in meringue for garnish; chill at least 4 hours. CUTTING TIP: To neatly cut meringue pies dip thin knife blade in water or spray with vegetable spray before attempting to cut. This coconut cream dessert can easily become one of your favorite banana desserts. This banana cake is filled with a luscious coconut filling; what a heavenly tropical combination. Bake coconut and pecans in shallow pan for 5 to 10 minutes or until toasted; stir occasionally. Grease 2 9 inch round cake pans, line with wax paper, grease and flour wax paper and set aside. Beat butter gradually adding sugar; beat until creamy. Add eggs one at a time beating well after each until well blended. Add buttermilk and mashed bananas and beat until blended. Combine flour, baking powder, baking soda and salt; add to butter mixture and beat until blended. Fold in pecans; pour batter evenly into prepared pans. Bake for 25 minutes or until pick comes out clean; cool on wire rack 10 minutes. Remove cakes from pan and peel off wax paper; cool completely on wire rack. Combine and blend all filling ingredients; bring to boil over medium heat stirring constantly. Cook while stirring until mixture thickens; remove from heat. Place pan in ice water to cool; stir occasionally until cool. Combine banana slices and lemon juice; stir gently to coat and drain completely. Spread 1 layer of cake with 1 1/3 cups of filling; arrange bananas over top. Spread with another 1 1/3 cups of filling; top with remaining cake layer. Spread top of cake with remaining custard; sprinkle top with toasted coconut. 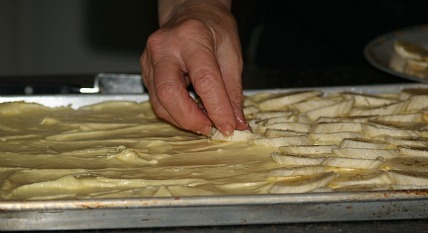 Brush bananas with butter; place in shallow baking dish. Combine honey and orange juice; mix well. Pour juice over the bananas; sprinkle with chopped pecans. Bake at 375F degrees for 15 minutes (JUST TO HEAT NOT TO COOK; DO NOT OVER COOK). Grease bottom of 1 ½ quart soufflé dish. 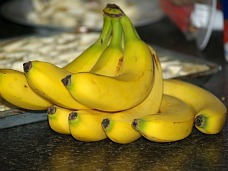 Peel and slice bananas; in food processor blend bananas and lemon juice until creamy. Mix sugar, cornstarch, nutmeg, lemon peel and salt in 3 quart saucepan. Stir in milk until well blended; cook over medium heat until thickened stirring constantly. Remove from heat; PREHEAT OVEN to 375F degrees. In a small bowl beat egg yolks with a fork; briskly stir a little of hot mixture into the beaten yolks. Pour yolk mixture back into hot mixture stirring briskly; stir in butter, vanilla and banana mixture. With mixer beat egg whites on high speed until stiff peaks form. Carefully fold whites into banana mixture; pour into prepared soufflé dish. Bake soufflé for 35 minutes or until golden brown; serve immediately topped with whipped cream.